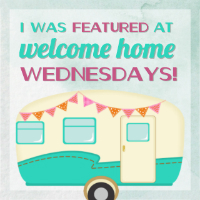 Welcome to Welcome Home Wednesdays number 80! Wow…80! Thank you all so much for showing up each week to party with us! Welcome to Welcome Home Wednesdays number 79! I hope you got to spend Valentine’s with the people you love most! My daughter had her first soccer practice so it was a quick steak dinner at home for us, but at least we were all together! Welcome to Welcome Home Wednesdays number 78! Happy February and welcome to Welcome Home Wednesdays number 77! Do you know someone that loves tea? This tea gift set is a simple and sweet Valentine’s idea for the tea lover in your life. You can put this together in just a few minutes and I’ve included 2 versions of the “You’re My Cup of Tea” gift tag! Being a southern girl, I’m partial to sweet iced tea, but I know lots of people that drink hot tea, so I made both! I even created a free printable tag for each one that you’ll find below. I layered everything in the jar and added this cute “You’re My Cup of Tea” tag. I used bright summer colors instead of traditional Valentine’s colors because I’m thinking this would make an awesome end of school year gift too! Biscotti- I don’t drink hot tea, but I’m pretty sure you’re supposed to have “biscuits” with your tea! So, which do you prefer? 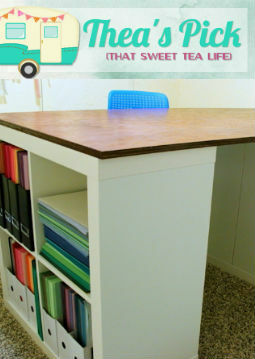 Hot Tea or Sweet Tea? If it’s hot tea, I promise we can still be friends! I hope you are inspired to create a sweet Valentine gift for the tea lover in your life! If you’re looking for more Valentine gift ideas, check out these DIY Puzzle Piece Valentines. Welcome to Welcome Home Wednesdays number 76! I can’t believe January is almost over! Ya’ll have started the year off strong with some awesome projects! I can’t wait to see what you have for us this week! Welcome to Welcome Home Wednesdays number 75! Welcome to Welcome Home Wednesdays number 74! We are so excited to introduce THREE new hosts to the party! Kandice, Thea and Leslie are here to party with us! That expands our party to 8 hosts & 8 blogs! We are going to party like ROCK STARS here!! Please be sweet and stop by and visit their blogs to get to know them better! Welcome to Welcome Home Wednesdays number 73! I absolutely adore looking through your projects every single week and this week is no exception! We’ve been hanging out with y’all and sharing and loving all the goodies shared here!! Thank you ALL for coming back week after week!! We APPRECIATE y’all!! So, there you have it! These were the top 10 posts of 2016! Thanks so much for following along and for all of the sweet comments this year. I hope everyone has an amazing 2017!